See these people? I don't know them. Or, at least I don't think I know them. I could have been on this very plane with them before this. Or not. Who knows? I usually only see the backs of peoples heads. They all start to run together, eventually. Wait. That guy two up on the left? In the light blue windowpane shirt? Maybe I saw him once. It happens. 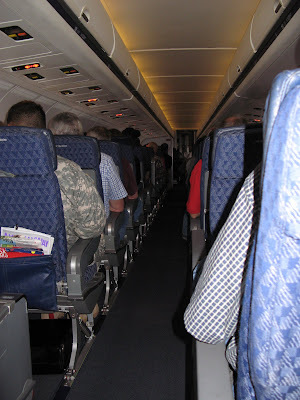 All I know is that this is a view I've not had for a couple of months--staring up the aisle of a McDonnell Douglas Super 80. Can't say I truly missed it, this summer, but once I get back in the swing of the M-F travel warrior thing, I sort of look forward to it. I'd rather be home cooking. Or gardening. Or writing. So that's where I am--back at it. Last year I traveled 33 out of the 52 weeks in the year. I bet it's not much different this year. It can be difficult, yes, but the road traveled is rewarding, as well. I do love the work I do. See those circles? No, they are not crop circles. Although I do believe it has to do with crops and I think they are somehow related to irrigation. 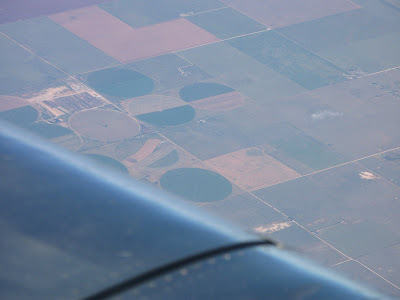 I always know when I see these circles, that I'm somewhere over west Texas or east New Mexico and heading toward Albuequerque. It was a bit hazy, today, even way up here. This view? The one out my hotel window. 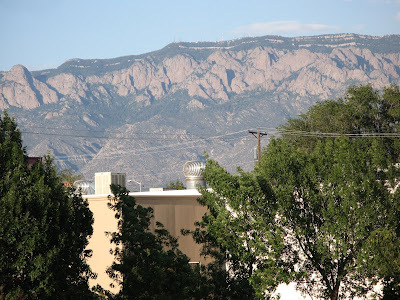 The Sandia Mountains in ABQ. The high temp was near 90 but the humidity is around 12%. Niiiicccccceeeee..... Now, if only those kids would stop running up and down the balcony outside my room. So what is the real sign that it's travel time again? The big purse comes out. With all of the luggage restrictions and fees these days, it pays to have the big purse. 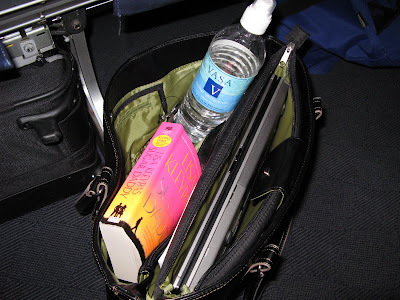 You can of course see that I've stashed the laptop, a bottle of water, and Lisa Kleypas' Sugar Daddy in there. What you can't see is my wallet, jewelry, medication, makeup, day planner, sunglasses, eye glasses, smart phone, steno pad with all my work lists, and a file of papers. Sort of reminds me of Mary Poppin's carpetbag. Yeah, it's official. I'm traveling again. This week Albuquerque. Next week, Bismarck.